Trawlers are sometimes confused with trollers due to their similar sounding names, but there are few similarities. Trawlers typically catch large quantities of midwater species, such as pollock or pink shrimp, and bottomfish, such as flounder, by towing a large, cone-shaped net. Most trawl nets have “doors” on either side of the net’s opening to help hold it open, and some that are fished near the bottom have a heavy chain strung along the bottom of the opening to hold it close to the sea floor. The net is retrieved via the use of huge winches and a power drum upon which the net is rolled as it is brought aboard. 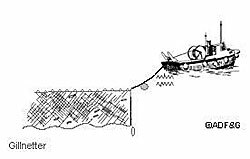 The end of the net, the “bag” or “cod end,” holds the fish and is usually pulled right up into the back of the vessel on a slanting stern ramp. Trawlers are generally large vessels; the largest in the ocean pollock fishery are factory trawlers that possess onboard processing facilities. These can be up to 600 feet in length. Catches are often enormous, with a 2-hour tow of the net yielding up to 100 tons or more, depending on the fishery, the size of the vessel, and the concentration of fish in the area. The trawl fishery may process its catches into fillets, as in the case of flounder destined for the fresh and frozen market, or minced fish called “surimi,” which is manufactured into fish sticks and similar products such as artificial king crab. Shrimp fishermen sort their catches by size and species and sell the product as either a whole, frozen product, or as a headed, frozen product. Longliners catch bottomfish (primarily halibut, blackcod, lingcod, and rockfish) via a long line that is laid on the bottom. Attached are leaders (called gangions) with baited hooks. Each longline can be up to a mile in length and have thousands of baited hooks. The lines are anchored at each end of each “set.” Lines at the ends run to the surface and are marked with a buoy and flag. A longline vessel typically sets several lines for a 24-hour “soak.” The lines are retrieved over a side roller with a power winch, and the fish caught are bled or dressed and then packed in ice in the vessel’s hold. Longliners are typically large vessels, 50 feet to 100 feet in length, with a weather cover on the stern to protect the crew. The longlines are coiled and stacked on deck in tubs when not in use. Most vessels in this fishery can pack 20 to 40 tons, or more, of iced product before returning to port. Longliners are readily identified by their weather cover and, when not fishing, by the numerous orange buoys and flags that are tied along their rails. This fishery delivers its catch whole and bled (rockfish), or whole and gutted (halibut), or headed and gutted (blackcod and lingcod) for subsequent sale to fresh and frozen markets. Gillnetters catch salmon, primarily sockeye, chum, and coho, by setting curtain-like nets perpendicular to the direction in which the fish are traveling as they migrate along the coast to their natal streams. The net has a float line on the top and a weighted lead line on the bottom. Some fishermen attach an orange buoy ball between the net and the boat, making it easier for traveling boats to see the net is out. The end of the lead line is normally attached to a 2 or 3 ft diameter rubber hose ring or engine belt. The ring is generally garden hose and has lead line in it. This prevents the end of the lead line from tangling in the meshes and tearing holes in the net. The mesh openings are designed to be just large enough to allow the male fish, which are usually larger, to get their heads stuck (gilled) in the mesh. Much larger fish and the smaller females are not so readily gilled. Gillnets work best in silty or turbid water which makes them difficult for the fish to see.